As family lawyers, if Dr Foster shows us one thing then it is exactly how you do not co-parent children following on from a separation. This week the BBC aired the second season finale of its much anticipated drama Dr Foster. For those who have managed to miss it, here is a quick re-cap and your spoiler alert! The show revolves around a couple, Gemma and Simon Foster, who split up following Gemma’s realisation that Simon has been having an affair. Season one focused on Gemma discovering the affair and the split, whilst season two has focused on Simon re-marrying his paramour and how Gemma and their son Tom deal with that. As family lawyers, if Dr Foster shows us one thing then it is exactly how you do not co-parent children following on from a separation. Throughout the season we see Gemma and Simon battling for Tom’s attention, involving him in inappropriately adult conversations about the other parent, and using him as a way of seeking revenge on them. The season finale ends with Tom deciding that he would be better off on his own rather than with either of his parents, and running away from home. Now, as a TV show, it is easy to look at these characters and think that they are exaggerated, dramatized, fictional characters who could not possibly exist in real life. However, during acrimonious separations they are characters which we, as family lawyers, see quite often in family cases. 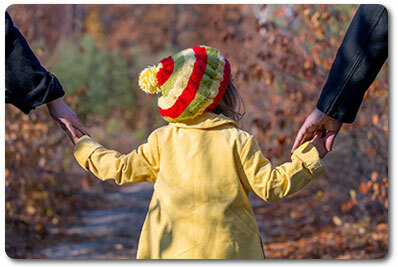 During a separation it can often be difficult for parents to put their own emotions aside in order to consider the needs of their children first. In Scotland, the key principle in all decisions relating to children is what is in the best interests of the child. That is a golden starting point for any parents thinking about how to cope with co-parenting after a difficult split. Sometimes, despite your best efforts, you can find yourself facing up against a Simon or Gemma Foster. You are doing everything you can to be reasonable and put your child first, but they seem hell bent on destroying your relationship with them. If that is the case, then you should consult a family law solicitor immediately and above everything else, do not take matters into your own hands or involve your children in the dispute. Children should never feel like they are a ‘go between’ with their separating parents or feel like they should have to choose one parent over the other. Communication is key. Attempt to communicate about your children with your ex-partner in a constructive way. Make sure you use the correct time and forum to do so (and through solicitors if necessary). Reassure your children. They need to know, and be told, that both of you still love them and that your separation does not affect your feelings for them. Do not involve them in conversations about your relationship with your ex-partner. They should never feel that they have to have adult conversations with you about the breakdown of your marriage. Encourage them to keep a meaningful relationship with your ex-partner and facilitate that. Despite the reasons for the breakdown of the marriage, children will often want to keep a relationship with both of their parents and can often feel uncomfortable in telling you that. You should be the adult in the situation and make sure that they know that it is ok with you that they still love and want a relationship with your ex. Put your own feelings about the breakdown of the marriage to one side and always make decisions based on the best interests of your children. Focus communications between you about your children, and your children alone. Do not use handovers as a reason to discuss (aka shout about) unresolved issues in your marriage. Never speak negatively about your ex to your children. No matter how awful they are to you, this will make your children feel that they cannot be honest with you about their own feelings about their other parent. Find an appropriate forum to deal with your own feelings about the breakdown of your relationship. Separations are emotionally difficult, and it will help your children if you are as emotionally stable as you can be. We would always suggest involving the services of a relationship counsellor who are trained and able to provide you with some emotional support during a difficult split. Put yourself in their shoes. Whether that is your children or your ex-partner, before making a decision about something you are arguing over, put yourself in the other person’s shoes and try to see things from their point of view. This will help you to feel less aggrieved and instead to think about what is best for your children. And last but not least, pick your battles. It’s important to have common ground rules about the upbringing of your children, but also each of you will have different ways of dealing with some situations. Don’t expect your ex to do everything exactly the same way you do it. You wouldn’t do everything the same even if you were still married, and that’s ok.
Co-parenting can be difficult even at the best of times, and so a lot of hard work and understanding is required to make it work. It can be easy to say ‘my ex is being difficult, so I have to be difficult’ but often all this results in is your children bearing the brunt of it all. Often you will find that approaching a disagreement about parenting in a reasonable manner will de-escalate the situation and allow your ex to see a better way for things to be done. Co-parenting can be difficult even at the best of times, and so a lot of hard work and understanding is required to make it work. If you are struggling to cope with a toxic ex on your own, you should consult a family law solicitor. We can suggest alternative, supported dispute resolution methods such as mediation and collaboration, to try and encourage you both to be able to co-parent in a productive way in the best interests of your children. In the meantime, if you would like a master class in how things shouldn’t be done, then you can catch series 2 of Dr Foster on BBC iplayer.